Seven Bell Ringers from Hancock journeyed to Beverly to play two Twelve Bell concerts at The Children’s Center for Communication / Beverly School for the Deaf on Thursday, May 31st. The first concert was played to a packed room of over 40 students from kindergarten through high school along with 20 staff members, and contained music from both classical and folk repertoires. The second concert was geared for preschoolers, and included old favorites such as “Old MacDonald Had a Farm” and “Yankee Doodle”. The hearing impaired audiences relied on staff member Desiree Weems to translate Deb Holland’s program notes into ASL. After both concerts, the bell ringers showed each student how to ring the bells using either their hands or mallets. 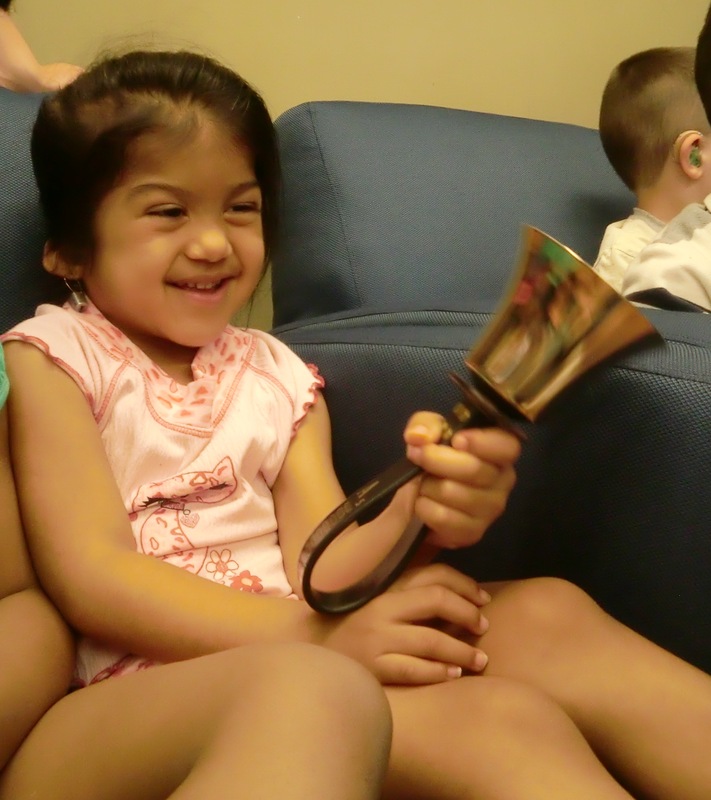 Many students loved feeling the vibrating bells – making the sound “real” to them. It was so gratifying to see the surprise and joy on their faces when they realized that the buzz they felt was coming from the rung bells. The staff later reported what a calming affect the bell music had on the children. After the concerts the Hancock ringers were given a tour of the facility by fellow bell ringer and staff member Lynne Batty. The Beverly School for the Deaf is over 100 years old and is perched on a beautiful site overlooking a tidal marsh and downtown Beverly. The school has a new addition, and we were able to see all the terrific spaces that they have for assisting children with a variety of handicaps. The highlight of our tour was seeing a classroom in the new wing that was donated by an anonymous donor and dedicated to our own Lynne Batty for the terrific work that she has done with physical therapy at this school. Well done Lynne! 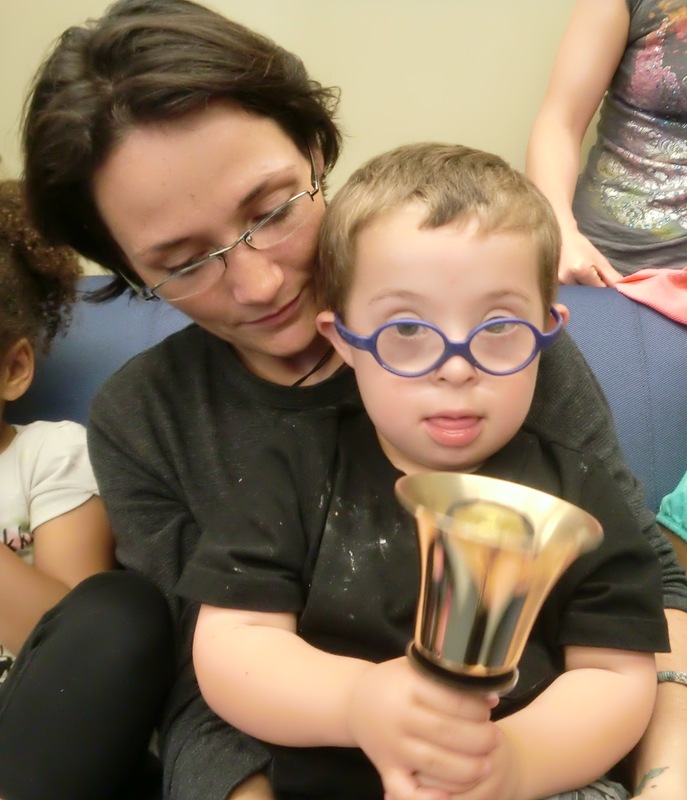 The 12 Bell group that visited The Children’s Center for Communication / Beverly School for the Deaf was thoroughly rewarded for their efforts by the enthusiastic reception that they received by the staff and students at the school. We cannot help but be impressed with the facilities and the dedication of the staff. Their job of reaching out to children who are multiply handicapped is not an easy one, but the rewards of seeing smiles on these children’s faces is certainly great. We were privileged to play music for this terrific group. Patriot’s Day Concert–A Huge Success! 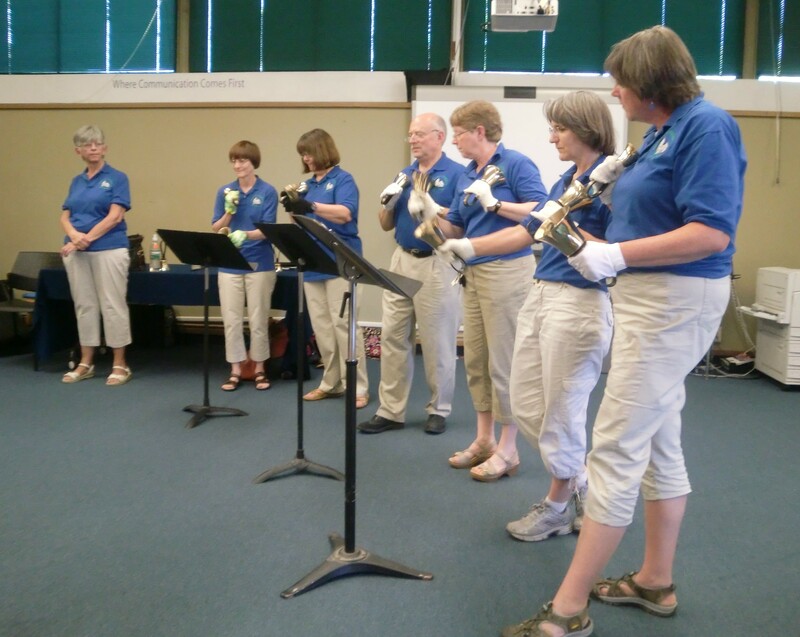 The Patriot’s Day Handbell Concert on April 16 was a huge success. Thanks to beautiful weather, the concert by the 4 bell choirs regaled a record-breaking audience of 215 with toe-tapping patriotic and American music. 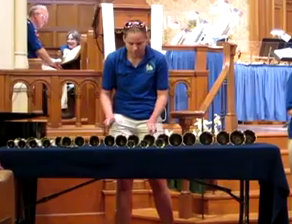 The highlights of the concert were Allison Bukys’ handbell solo called “The Typewriter” with typewriter percussion and the flag that unfurled from the arch of the chancel during America the Beautiful. Donations from the concert totaled $658 for the Fourth Presbyterian Church, South Boston for scholarships to their after school and summer music and arts program. Nine youth from the program attended the concert with their director, Rev Tim Hughes, and afterward the Christian Service committee treated them to a day of fun with a picnic at the Center playground before watching the afternoon parade. Thank you to all the hardworking Hancock folks that made this benefit concert and collaboration with Fourth Presbyterian possible: directors, ringers, tv crew, MC, Christian Service committee, LHS National Honor Society volunteers, and the many Hancock volunteers. If you missed the concert and would like to view it, it is available streaming on LexMedia. If you would like to support Fourth Presbyterians’ mission to serve youth in South Boston, the Christian Service committee will be accepting donations of used keyboards, guitars, percussion instruments, and music stands as well as monetary donations. Contact Laurie Bergstrom if you have items you would like to donate. The Well will be holding a jazz night during its service on Sunday May 6th at 6:15 in Clark Hall at Hancock Church, 1912 Massachusetts Ave in Lexington. Joining The Well’s house ensemble, The River Rock Band, will be jazz singer Patrice Williamson, jazz violinist Ben Powell, trumpeter Wayne Pearcy, and pianist Aaron Gratzmiller. Williamson has been compared to Ella Fitzgerald and Sarah Vaughan by such publications as the L.A Times. Violinist Ben Powell has played major venues around the world including the Tanglewood Jazz Festival and Sculler’s here in Cambridge. Pearcy and Gratzmiller are both students at the Berklee College of Music. 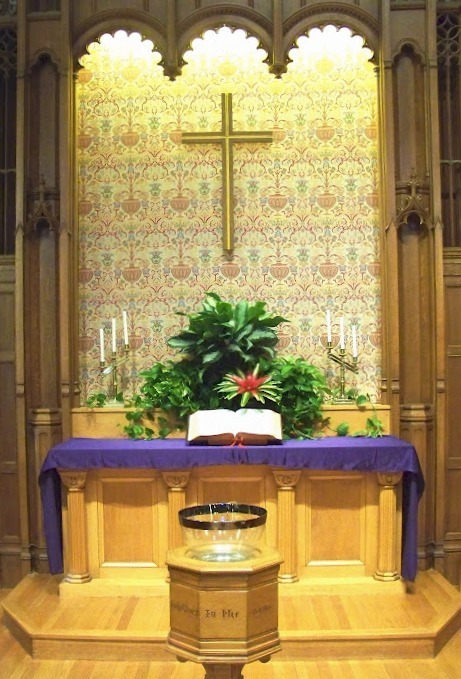 The Well is an informal, intimate, and progressive worship service offered by Hancock Church. It is open to all. It is held in the candlelit Clark Hall, which can be reached via the parking lot in the rear of the church. Angels have been a source of intrigue, mystery and delight for people of all ages throughout history. On Saturday, May 5th at 7:30PM in the Sanctuary of Hancock Church the early music ensemble A Joyful Noyse will present a program entitled Voices of Angels. 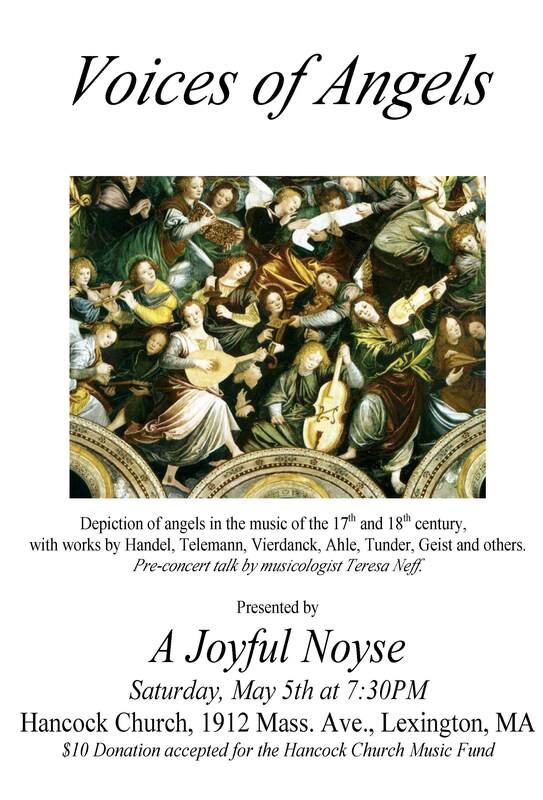 A Joyful Noyse is an early music ensemble dedicated to performing liturgical music of the 15th to 18th centuries. It is composed of professional and talented amateur singers and instrumentalists from the greater Boston area. Joining the ensemble will be musicologist Dr. Teresa Neff, who will give a talk on how angels were represented in the music of the Baroque era. Dr. Neff teaches at Boston Conservatory and MIT and gives preview lectures for Boston Lyric Opera and the Handel and Haydn Society. 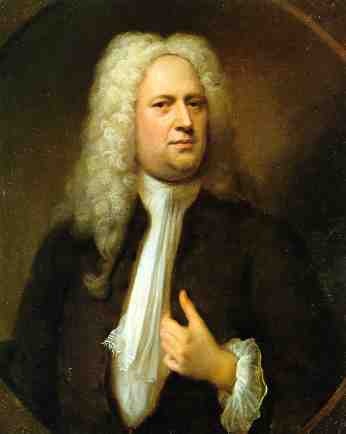 Of the composers represented in this concert some, like Telemann and Handel, are well known, but others, like Johann Kuhnau, Johann Vierdanck and Johann Rudolph Ahle, you may be hearing for the first time. With soloists, chorus and chamber orchestra, the music will soar to the heavens. 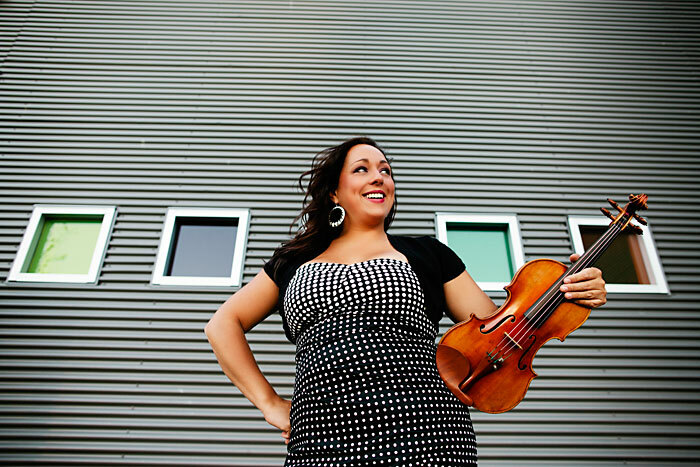 Fiddler Ivonne Hernandez Returns to The Well This Week! Fresh off of months of touring, award winning fiddler Ivonne Hernandez returns to play with the River Rock Band this Sunday, April 1st. Expect a great evening of inspiring and intimate worship accompanied by great fiddle tunes and uplifting songs! And join us next week, Easter Sunday, for Gospel night at The Well featuring pianist Malcolm Campbell and guest soloists! 7:30 pm The River Rock Band and members of HYG will provide mu7sic for this candlelit service of tenebrae in the Sanctuary. 9:00 am and 11:00 am Services: The Chancel Choir, Hancock Carillon Bell Choir, along with brass and timpani will help us celebrate Easter with joyous music including Randall Thompson’s Alleluia, and Handel’s Hallelujah Chorus. 6:15 pm The River Rock Band will be joined by guest musicians, including our own Malcolm Campbell, for a joyous Easter celebration of Gospel Music. Sing with the choir for our spring Cantata! Come join the chancel choir in singing for our spring cantata, Handel’s Sing Unto God. This rare cantata will be accompanied by a period orchestra. We will also sing the Amen chorus from Messiah. The cantata will be sung in worship on Mother’s Day, May 13th. Rehearsals take place on Thursday evenings at 7:30 in the choir room. Cantata music will be rehearsed first at each rehearsal. Adults and high school students of all levels of experience are invited!